Videos, songs, examples, solutions, worksheets, games, and activities to help students learn number bonds in Singapore Math. 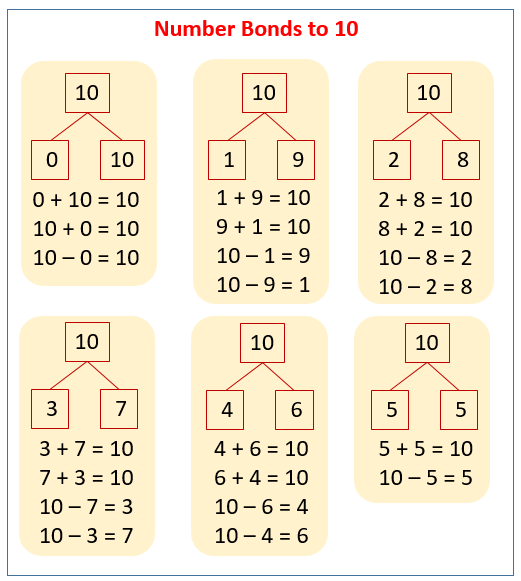 The following diagrams show to number bonds of 10. Scroll down the page for more examples and solutions. Number bond is a concept used in Singapore Math and Common Core Math. It is a visual image that can be used to show the relationships between addition and subtraction. 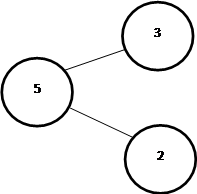 A number bond consists of a minimum of three circles connected by lines. The “whole” is written in the first circle and its “parts” are written in the adjoining circles. The "parts" when added together will then equal the "whole"
The following number bond can be used to represent four number sentences. This video explains number bonds and how they can be used to make addition and subtraction number sentences. Introduction and tutorial for Kindergarten and First Grade. The video shows how number bonds can be used to "split" numbers. Farmer Pete he had 10 sheep. All were in the pen. 10 were safe and none had gone. 10 add 0 makes 10. "Oh dear! ", said Pete, "where is my sheep? There's 9 here in the pen." 9 are safe and 1 has gone, 9 add 1 makes 10. "Oh dear! ", said Pete, "where are my sheep? There's 8 here in the pen." 8 are safe and 2 have gone, 8 add 2 makes 10. "Oh dear! ", said Pete, "where are my sheep? There's 7 here in the pen." 7 are safe and 3 have gone, 7 add 3 makes 10. "Oh dear! ", said Pete, "where are my sheep? There's 6 here in the pen." 6 are safe and 4 have gone, 6 add 4 makes 10. "Oh dear! ", said Pete, "where are my sheep? There's 5 here in the pen." 5 are safe and 5 have gone, 5 add 5 makes 10. "Oh dear! ", said Pete, "where are my sheep? There's 4 here in the pen." 4 are safe and 6 have gone, 4 add 6 makes 10. "Oh dear! ", said Pete, "where are my sheep? There's 3 here in the pen." 3 are safe and 7 have gone, 3 add 7 makes 10. "Oh dear! ", said Pete, "where are my sheep? There's 2 here in the pen." 2 are safe and 8 have gone, 2 add 8 makes 10. "Oh dear! ", said Pete, "where are my sheep? There's 1 here in the pen." 1 is safe and 9 have gone, 1 add 9 makes 10. "Oh dear! ", said Pete, "where are my sheep? There's none here in the pen." None are safe and 10 have gone, 0 add 10 makes 10. A song to help you learn what makes ten. They make ten! They make ten! This video is suitable for parents and teachers who want to find out more about the advantages of using number bonds. Number bond is a representation that supports children in seeing composing-decomposing actions (a prerequisite skill for developing arithmetic strategies). • Support learner's attempts to 'decontextualize' the mathematical relationships embedded in words. Number bonds for additive relationships - one graphic effectively demonstrates the relationships between 3 whole numbers. They can be a useful tool in exploring the commutative property of addition. Number bonds can be used to model number relationships and are useful representations for facilitating connections. • Children learn to represent a mathematical situation with concrete materials. • They learn to identify parts and whole through dialog with teachers and peers as the number bond is being constructed. • They start to make number bonds on their own. • They start to write equations for easiest problem types (result unknown / total unknown problems) after extensive teacher modeling.